Larry Fink, Chairman and CEO of the world’s largest investment firm, recently noted that long-term corporate prosperity requires not just financial performance, but “a positive contribution to society.” He does not stand alone with this opinion – nearly every major Silicon Valley venture capital firm backs companies that pursue sustainable practices. In short, there is a profound shift underway in how capital markets value companies. So if you’re an investor, what do you need to know? B Corporations demonstrated a greater revenue growth rate than public firms of comparable size from 2006 to 2011—a period that includes the Great Recession. And between 2013 and 2015 impact investors’ assets under management grew by 18 percent compounded annually, according to The Global Impact Investing Network. Importantly, though, certification as a B Corp or Benefit Corporation does not by itself promise solid financial returns. Rather, these designations provide investors with a novel and increasingly robust lens through which to evaluate companies, says Managing Director and Owner of The Caprock Group, Matthew Weatherley-White. This publication comes at a time when both corporate and investor interests in sustainability are maturing. Today, 2,500 companies have certified as B Corps and 5,000 entrepreneurs have incorporated their U.S. ventures as Benefit Corporations across 37 states, Washington D.C., and Puerto Rico. In 2015, Laureate Education was the first Certified B Corp and the third Benefit Corporation to go public, raising $450 million in its IPO. At the same time, JP Morgan has pegged the market for socially responsible investing somewhere between $400 billion and $1 trillion dollars. Through greater appreciation of the real motives that drive and excite people, B Corporations provide a significant new opportunity for investors. I think they could make more profits than any other types of companies, and this guide helps investors understand why. Written by Alex Buerkle M.B.A ’18, Kylee Chang M.E.M. ’19, and Max Storto M.B.A. ’20, M.E.M. 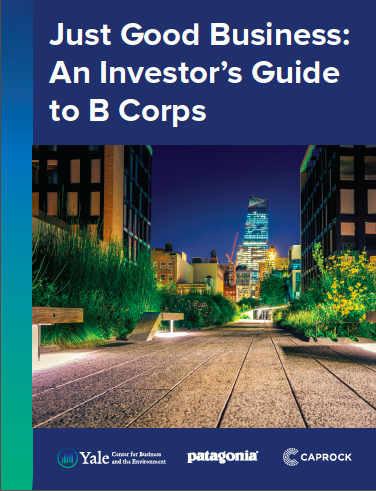 ’20, “Just Good Business: An Investor’s Guide to B Corps” draws on more than 60 interviews with individual and institutional investors, top academics, and entrepreneurs. The full report can be downloaded here.